Some of the RINGO research & development team at the THES awards night. 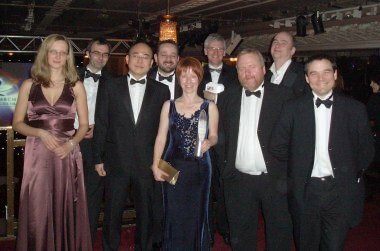 Left-to-right: Andrea Gomboc, Chris Mottram, Shiho Kobayashi, Andrea Melandri, Carole Mundell (holding award), Mike Bode, Chris Collins, Iain Steele, Robert Smith. Also present was Stuart Bates (off-camera). The ARI has won this year's prestigious Times Higher Education Supplement (THES) award for "Research Project of the Year" thanks to pioneering work with the RINGO optical polarimeter instrument on the LT. In judging the team's project, entitled "Measuring Gamma-Ray Bursts", the distiguished Oxford scientist Professor Peter Atkins said: "the judges were impressed by the extent of teamwork involved in achieving a successful outcome". Fellow judge Professor Philip Esler, Chief Executive of the Arts and Humanities Research Council, said the team had made a "brilliantly innovative discovery into the fundamental nature of the Universe that could have profound impacts in the decades ahead". Accepting the award at a ceremony in London's Grosvenor House Hotel on Thursday 29th November, Professor Carole Mundell, leader of the Gamma-Ray Burst science team said "this award recognises the dedication and close teamwork of our instrument scientists and observational and theoretical astrophysicists." Professor Iain Steele, leader of the ARI instrumentation team, said: "When we made our case, the University immediately recognised the scientific importance of our proposal and approved fast-track development of the instrument". Professor Chris Collins, who supported the research and nominated the team said: "This is a wonderful achievement that has built on Professor Mike Bode's original vision for using large robotic telescopes to catch transient events in the Universe." The RINGO GRB scientific result was published in the prestigious U.S. journal Science, in March 2007. More details on the Times Higher awards for 2007 can be found at this page.